Be the first to share your favorite memory, photo or story of Melissa "Miss". This memorial page is dedicated for family, friends and future generations to celebrate the life of their loved one. 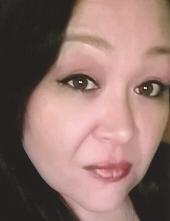 Melissa “Miss” H. Wade, 35, Oneida, passed away unexpectedly of natural causes on Thursday, March 14, 2019. She was born in Milwaukee, WI on May 17, 1983 to Frank Wade and Julie (Sommers) Cornelius. Miss was a true family woman who loved being a mother to everyone in her family and cooking for them. She was an amazingly lovable, happy, and caring person to anyone. Melissa is survived by her daughter Julissa “JuJu” Amarie Fuentez; her mother Julie Cornelius; her father Frank (Carmen) Wade; her siblings: Michelle Wade, Leland Skenandore, Biddy Wade, and James Huff; paternal grandmother Joyce “Dodo” Ninham; and nieces, nephews, cousins, and other brothers and sisters. She was preceded in death by her paternal grandfather Paul Wade; maternal grandparents Julius (Hazel) Sommers; and aunts, uncles, and cousins. Family and friends may visit from 11:00 AM to 2:00 PM on Tuesday, March 19, 2019 at the Ryan Funeral Home & Crematory, 305 N. Tenth St, De Pere. A funeral service will follow at 2:00 PM with procession to the Oneida Sacred Burial Grounds for burial services. Please visit www.ryanfh.com to send any condolences to Melissa’s family. To Willie “Chookie” Adams III, we want to thank you for being in Melissa’s life; she has been the happiest she has ever been in a very long time. We will never forget the love you showed her. To send flowers or a remembrance gift to the family of Melissa "Miss" H. Wade, please visit our Tribute Store. "Email Address" would like to share the life celebration of Melissa "Miss" H. Wade. Click on the "link" to go to share a favorite memory or leave a condolence message for the family.